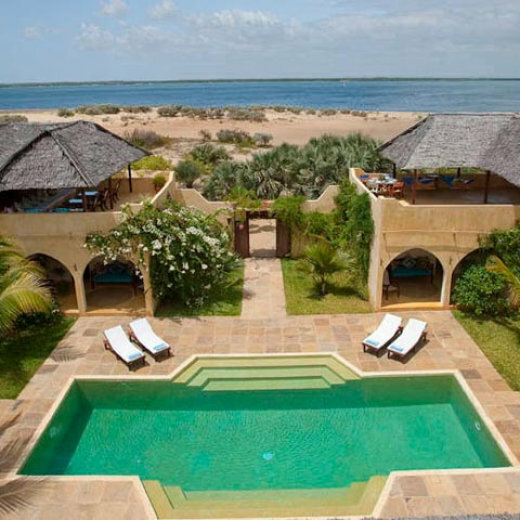 This is the south-most property on Kizingoni Beach, Lamu. Spacious, cool design and palm fringed position have made it a great favorite with family visitors and party groups alike. Entertaining areas are vast and cool, decorated with traditional carved plasterwork and sturdy hardwood furniture. Brightly patterned kanga-covered cushions invite you to sink onto expansive baraza seats or cool swinging beds that are so comfortable you never want to move. There are bookshelves and bars, intriguing local artifacts, generous pots full of bright green ferns and palms and the discreet, attentive staff, cheerfully carrying trays of fresh limejuice or afternoon tea. The ensuite guest bedrooms have private terraces, large netted beds and working desks. Even the pool has floating beanbags! At the back of the garden is a child’s climbing frame with a jungle gym and small hut which can also be used for sleeping overnight. A separate kitchen, with a laundry and staff quarters stands behind the house. Other features include, baraza areas, massage table, swinging beds and a large planted garden.